Alison's spiced apple blondies paired with a hot mocha. Cozy! We are so grateful for our friendly neighbors, Giant Coffee! 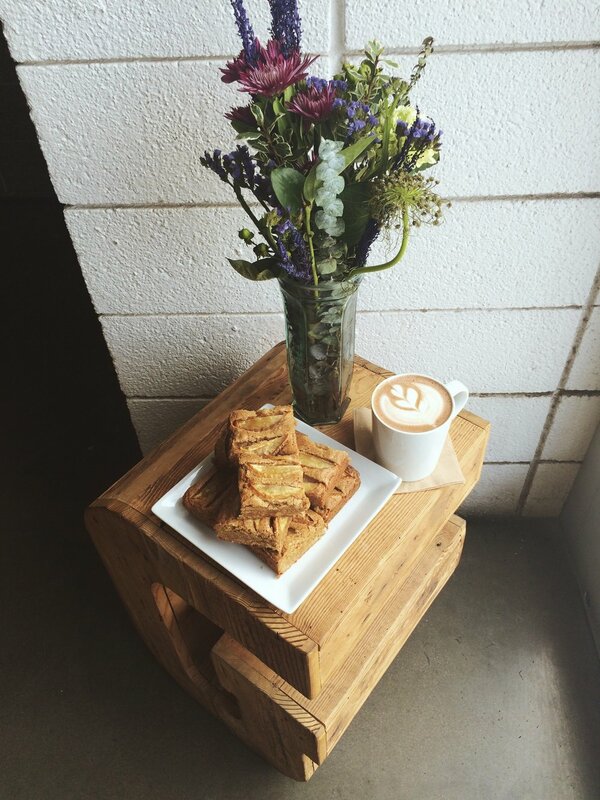 Aside from serving up specialty Four Barrel Coffee and organic teas, Giant slings some pretty amazing pastries; all made from scratch from the best-of-the-best ingredients. For the third installment of Seasonal Recipes with Giant Coffee, we sat down with baker Alison, who has won our heart over the past few months with her ever-changing assortment of gluten free baked goodies! It is a lovely late summer morning at Giant. The kind of morning when the rain clouds hover lazily and you savor every moment of the fleeting early morning calm. The smell of warm spiced apples fills the building. Alison's warm and approachable demeanor matches the day and the classic baked blondies she has baked for us. Her style is simple with a twist, just like her baking style. It is all about the small details; her tastefully cuffed denim and relaxed cardigan. Outside of work she loves to accessorize with long layering necklaces and rings, but at work the only accessories that leave the house with her are her two tattoos on either forearm; a whisk and a rolling pin. Perfectly simple with a look that is rustic chic. You half expect to spot some stray flour dotting the designs. The baker has been with Giant for almost a year now. Hailing from Missouri, Alison moved to the valley to attend Le Cordon Bleu's pastry school in Scottsdale. She fell in love with Arizona, and once Alison's mother joined her out here, the deal was sealed. 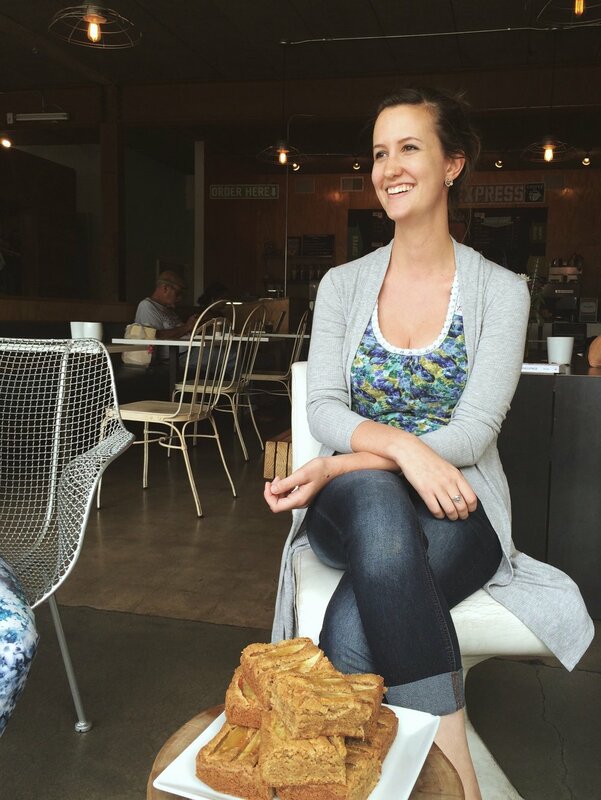 When asked what she enjoys about baking at Giant Coffee, Alison noted the creative freedom she has experienced at the Phoenix coffeehouse, specifically how she can take recipe inspiration she finds elsewhere and add her own twist to fit the Giant culture. You can always find a muffin, scone and cake in the bake case (while they last, of course! ), but the flavors and ingredients change with the seasons. We are not the only ones appreciating the expanded gluten free options, either. Quite frequently the baristas will hear a satisfied customer state, "I had no idea this was gluten free!" after enjoying a pastry. A tip for gluten free baking: a high quality flour is essential. Instead of purchasing a mish mash of flours to combine, as gluten free baking typically calls for, find one quality flour blend to ease the baking process and yield a product with a better texture and taste. What about those hours? We asked Alison how she manages the strict schedule of a baking career. "I wake up at 4AM, and if I sleep in it is never past 5AM. Wake up early, and do it everyday, even on days off. If you need extra sleep, go to bed earlier. And shower at night!" Rustic in appearance and with a satisfyingly dense, crumbly nature, these GF Spiced Apple Blondies are made with the best ingredients possible, and boast a delightful baked apple topping. Alison attributes the crumbly texture to the lack of gluten, though these are simple to make "regular." They are a go-to for Alison because they are available year round, but especially perfect for fall because their cozy nature we tend to associate with warm cinnamon and crisp fall air. Aside from the incredibly moist cake and perfectly spiced flavor that balances seasonal flavors and year round appeal, Alison enjoys making these blondies because they are sophisticated, yet easy to whip up. She also notes these would make great lunchbox additions for kiddos and adults alike. Or, make one day ahead of a potluck, thanksgiving breakfast or holiday brunch for an unexpected treat that is still festive and delicious. This recipe can act as a base for experimenting with seasonal ingredients and flavors. Add cranberries in winter or cherries and dark chocolate in the summer, or swap the apples for pears or sliced peaches. A lovely hot Mocha. Thank you for the perfect pour, Shannon! Per recommendation, we paired our spiced blondies with an expertly crafted Mocha. Giant uses organic whole milk by default in their lattes, resulting in a beverage that is smooth, rich and balanced the whole way through. Alison recommended this pairing because simply, chocolate pairs well with everything. We can't argue with that. Giant's specialty chocolate comes from 21 Blackbirds. It is a dark chocolate with the perfect balance of bitter and sweet cocoa. The chocolate paired harmoniously with Four Barrel's Frendo blend. We loved the rich flavor and feel of this beverage and its smooth finish. Alison touched on the importance of your coffee + pastry pairing, and picking flavors that compliment one another as opposed to overpowering. Ask your barista for a pastry pairing from the daily selection with your next cup! In a medium sized microwavable bowl, melt butter. While butter is melting, measure the brown sugar into a large bowl. Let cool COMPLETELY before cutting! Thank you, Alison for sharing your time and these goodies with us! As for what is on the Giant baking agenda? "[I will make] Pumpkin pie soon...I love using pumpkin! And expect something festive the week of Halloween..."